The Typical Government Response From Fassbender’s Office – Buddy to KIP? Seems those of us who contacted Fassbender’s office are receiving the standard reply to concerns over Kensington Island Properties tactics. Thank you for responding to my email. I fully understand the purpose of a quorum and board. The problem begins when the developer is controlling the Trustees as Kensington Islands appears to be with the two remaining Trustees in his pocket, in my opinion. The sad fact seems to be conflict of interest is tolerated and the departments in place to ensure good governance lack the interest when a developer interferes and publicly lies to the landowners, in my opinion. I find it curious that a past Trustee who locked out the electorate from Jan. 2011 through April 2011, without the authority to do so and a landowner (Peter Jacques) were granted a meeting with Minister Fassbender who then appointed a Facilitator, who accomplished nothing and left more questions than answers. Yet, now all the landowners who have contacted Minister Fassbender’s office are being told there will be a by-election to restore a five member board and maintain a quorum. Where was this attitude of leaving the board to govern when the Minister appointed the Facilitator? The developer used the intervention by the Minister’s office to undermine the existing board and promote his candidates (the 2 existing trustees) and refused to sign the Memorandum of Understanding preferring to provide his trustees with a letter confirming the details of their conversations with the developer for a completely different agreement from the Facilitator’s MOU. 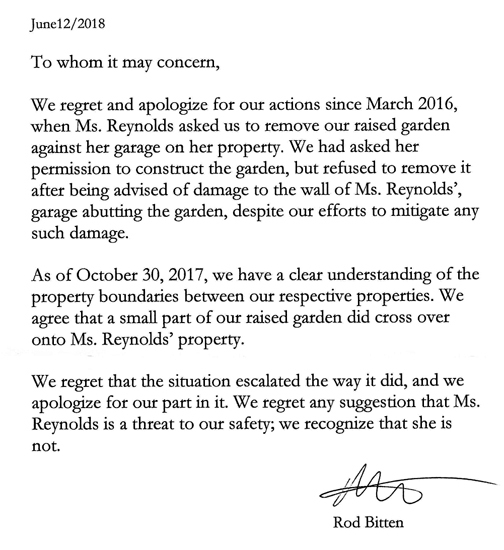 The Minister has caused more problems in Union Bay than existed prior to this special meeting and accommodations made for a developer and his supporters. 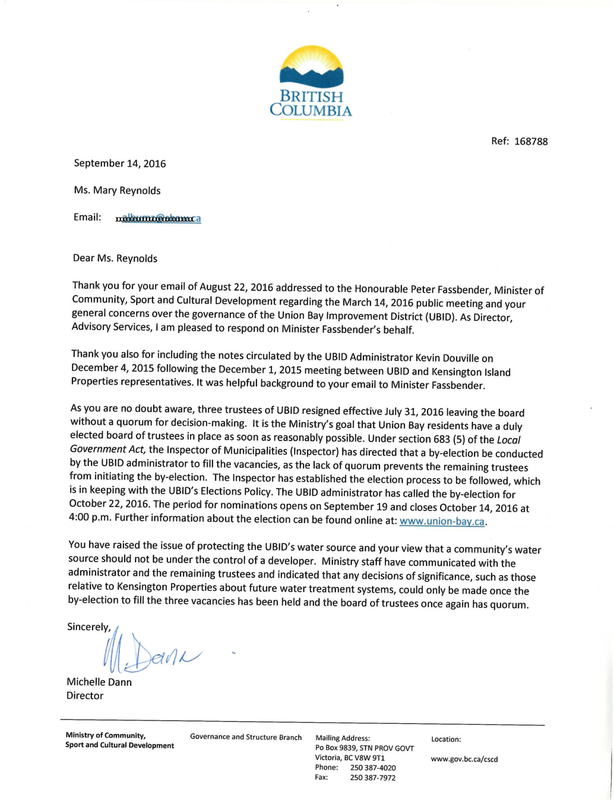 If anyone in your office is truly interested in what has transpired in Union Bay, check with the Ombudsperson’s Office and the number of complaints from 2010 onward. The investigators couldn’t believe so many things were happening in one improvement district. By the time the Ombudspersons Office completed the investigation the offenders were no longer in office. Mr. Godfrey being one of them. You acknowledge the minutes of the December 2015 meeting in your response but fail to comment on the two minute audio of the developer telling a completely different version of what is contained in the minutes. How can you read the minutes, listen to the audio and then compose a response which lacks the purpose of the original email containing those two attachments? The Minister’s response to the situation is unacceptable. The Minister created the situation – now wants to jump back and say – I don’t want to get involved. I’m attaching the two minute audio clip again. I’m also attaching a one minute audio clip, both explanatory by their title. MLA Don McRae has failed to answer emails and telephone calls regarding this audio. Could you please confirm if Don McRae was present when David Godfrey, Peter Jacques and VP KIP, Brian McMahon met with Minister Fassbender in 2015? PS. You incorrectly assume the administrator distributed the minutes I sent with my first email. It was given to me by someone else. The Administrator is professional, remains neutral, honest and trustworthy. You should not assume.